I AMsterdam, who are YOU? Now about my Amsterdam experience! 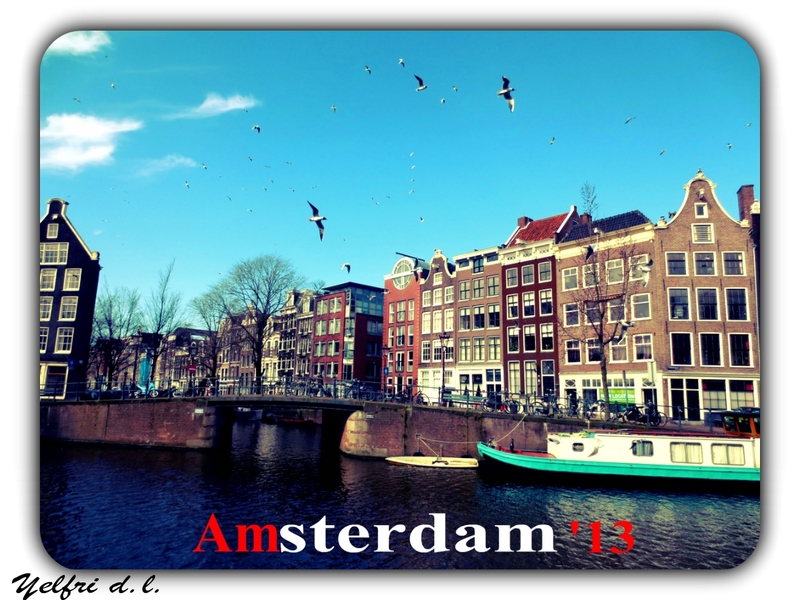 The first time I traveled to Amsterdam was when I was a junior in high school as part of a student-exchange program. Before coming to study in London, I wasn’t expecting to go back to visit. I wanted to keep exploring the world and see new things. But there’s something that keeps me coming back to this place. After looking at my pictures from junior year, I felt so melancholic that I said to myself, “I need to go back.” So I decided to make a quick trip and visit some friends. When I arrived to Amsterdam, I felt so happy to be back. I was even happier to see all my Dutch friends and reunite with them that same night. We all went out for dinner, and caught up. I also brought along with me another friend that was visiting Amsterdam for the first time. I felt so bad for her though. We picked the worse weekend to go to Amsterdam because it was unbelievably cold. Oh my God, I don’t think I’ve ever felt this cold in my entire life! It was FREEZING to the point where I had to wear two pairs of jeans, two pairs of socks, three sweaters, gloves, scarf, hat, a big coat and boots. You might think I’m exaggerating, but in all seriousness, I swear I’m telling you the truth. At least I didn’t have to do all the touristic things like: the House of Anne Frank, Van Gogh Museum, Rembrandt House, Vondelpark, the Ice Bar, the Heineken experience, etc. because I had done most of it in the past. There was no way I was paying for all that again! LOL! It was really cool seeing it for the first time (especially the House of Anne Frank), so I was content with just seeing my friends and walking around the city. I was lucky that I did not have to pay to stay at a hotel either as I was hosted by one of my friends. Oh, Amsterdam! Amsterdam is a unique place… To me, it is the most relaxing and enjoyable place on earth. The rich Dutch culture, its beautiful architecture, the liberal lifestyle, the friendliness of its people, its beautiful canals, the narrow pedestrian streets, the delicious traditional waffles, and the beautiful sights and scenery are the things that will always keep me coming back to this place. Not to mention all my lovely Dutch friends! 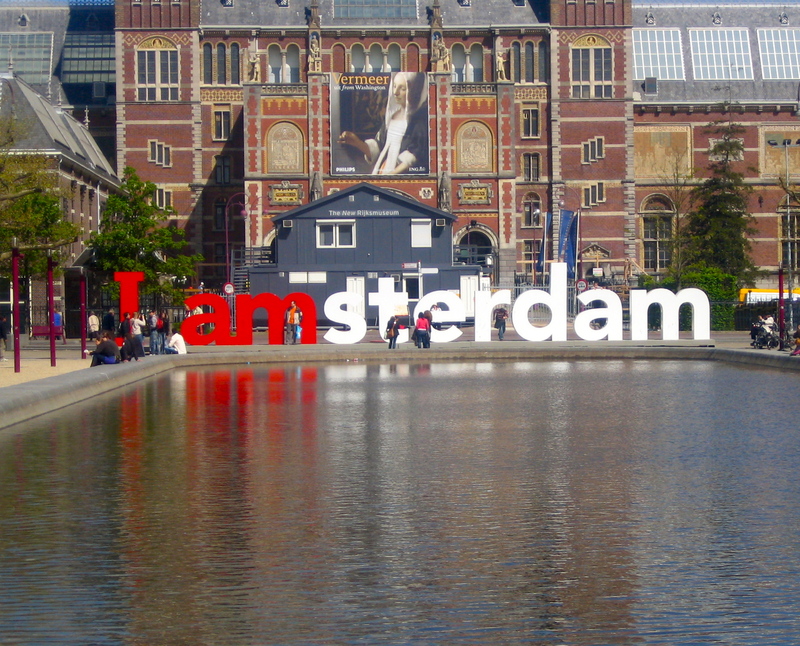 A lot of wild young people like to travel to Amsterdam primarily because…well, you probably know why. 😉 I guess I’m not too wild though… I believe that all is overrated. There is so much more to do in Amsterdam! It is a BEAUTIFUL city, and I’m afraid that not many tourists are able to appreciate that, so this is one of the reasons I was motivated to write this post. One of my favorite things about Amsterdam is the scenery. 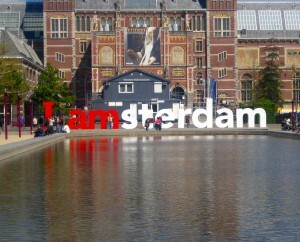 If you ever find yourself in Amsterdam for the first time, you will probably think that you landed in the wrong place. Huh? At least that’s what I thought the first time I went there. Amsterdam looks a lot like Venice in the sense that this city is comprised of canals (with the only exception that the canals in Venice are much narrower). 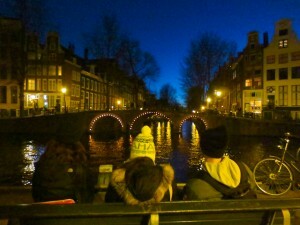 During the winter, these canals become ice-skating rinks and during the summer they are a source for the greatest nightlife in Amsterdam. Believe it or not, that’s just how it is! During the summer, people rent canal boats and host parties inside, isn’t that cool? 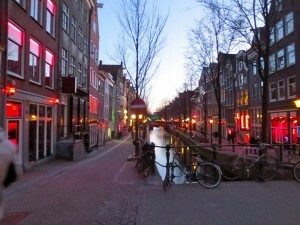 Oh, about the canals, you would probably not want to miss walking them at night. It is the most beautiful and romantic things you can ever experience. Of course, I did not miss out on it this time! Parked bikes along the canals. 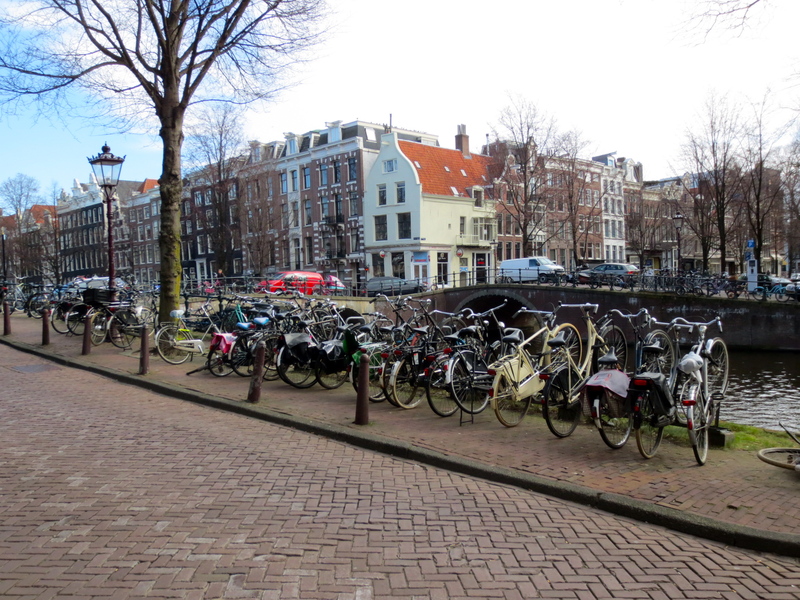 If there is one cool fact that you need to know about Amsterdam is that the amount of bikes in this city out-number its population. Bikes are everywhere! Thousands are parked all over the city and thousands are mounted by people on a daily basis. It is not unusual to see people wearing suits and riding a bike to work. In fact, Dutch people are so used to it that it doesn’t matter how cold or rainy it is, there are always people riding their bikes to work and school. I believe that besides the canals and beautiful architecture, this is one of the things that make Amsterdam stand out from the rest. Needless to say that when I was in Amsterdam, besides the brutal weather, my friend (the one visiting for the first time) and I went on a bike tour around the city… you know I’m adventurous! 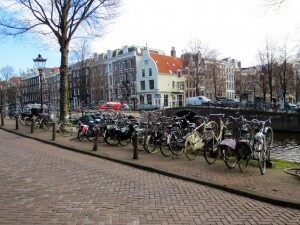 Biking along the narrow pedestrian streets of Amsterdam brought back a lot of great memories. It was quite a great experience. Amsterdam is a very open-minded society, and so are its people. Life in Amsterdam seems to be a lot more relaxed and laid back than in any other city I have been to in my life! Just being in Amsterdam is a different feeling… their relaxation is contagious. I don’t even know how to explain it. Being in Amsterdam makes you feel lazy all the time, but it feels great to walk around the city and go on a bike tour and see the canals lit up at night. Other places to consider in Holland are Haarlem, Leiden, and Rotterdam. If you get a chance, go to the countryside and explore the flower fields. It is really beautiful, especially during the spring season. Amsterdam is just a great city with a lot to do. I recommend anyone that visits Europe to visit this city. Like some of my friends put it, “Amsterdam is a lovely city, it has something to offer all its visitors.” “It does not matter what’s your lifestyle, I’m sure there will be something great awaiting you.” Amsterdam is my favorite place on earth! It might not have the most modern buildings or the best technology, but that’s exactly the reason why I love it so much. It is unique and different. The old architecture and its pedestrian streets are what give this city a different touch and feel. I love its culture, its people, and the awesomeness of its lifestyle. This place holds a very special place in my heart. 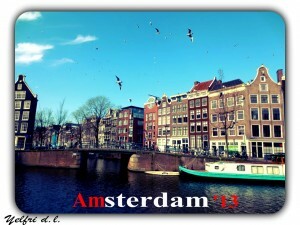 I <3 Amsterdam! ← Tales from the Archives: Boost! There is a great new book coming out “Amsterdam: A History of the World’s Most Liberal City.” The author is in Albany this week – sorry you’ll miss him. Watch for the book when you return.